College student Jennifer Quinn never took anything serious--until the day she saw her beloved, yet elderly and naive, history teacher attempt to confront two thieves with an old fencing blade. As she ran to his defense, both were struck by Energy X, and she become the colorful Jester. She served as sidekick to the professor, who, with his youth now restored and his blade given mysterious qualities, now styled himself as The Rogue. The two soon met up with Doc Astounding. Jester became one of the founding members of Liberty Inc., although acting primarily as a reserve member, not caring to stay around Goo any more than necessary. She is very much in love with The Rogue, but the daft professor hasn't seemed to quite figure it out yet. Jester's powers are primarily physical, like Rogue's. She has unusual agility and speed, being able to dodge even bullets at times. Her natural intelligence has caused her to invent a number of clown-themed gadgets, most of which work out of the modified toy gun she carries with her. She also has minor telepathic powers, which she can use as a form of hypnotism. 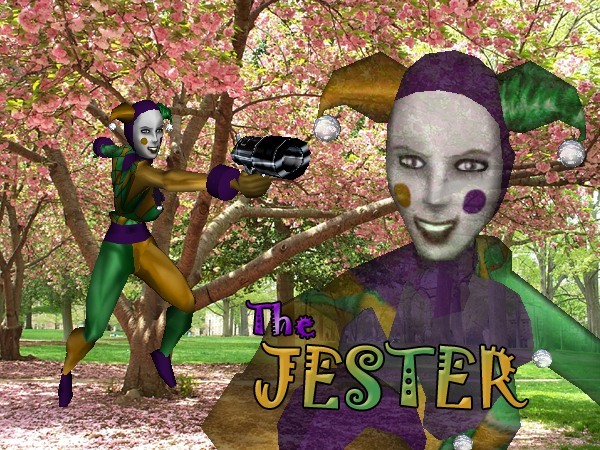 It allows The Jester to cause enemies to forget what they are doing, or to suddenly become enraged for no reason. These powers, unlike most of her abilities, are in no way related to any abilities that The Rogue has manifested, but such are the mysteries of Energy X.